Can BuzzSumo be integrated with other platforms? A list of ways you can integrate BuzzSumo's data into your own applications. BuzzSumo offers several integrations to help you put our data into action. You can share content from BuzzSumo directly to any major social network or via a social scheduling tool such as Hootsuite or Buffer. 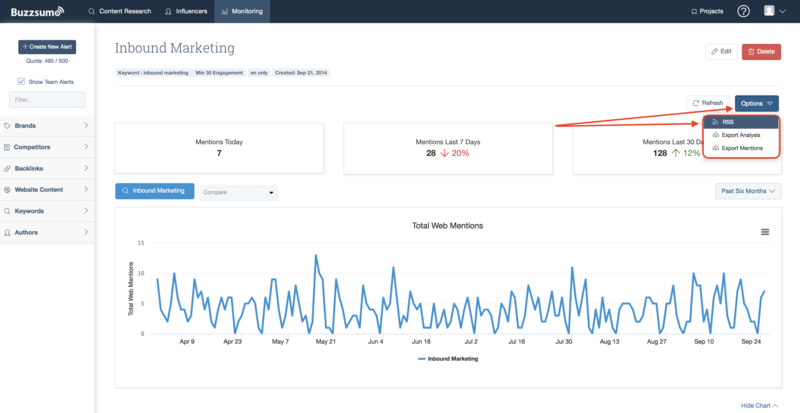 You may also connect your Twitter account to BuzzSumo via the Account screen. This will enable you to directly contact other Twitter users from our Influencers section. Users can create RSS feeds out of any Monitoring Alert or Trending Feed. Feeds can then be sent to other tools you frequently use such as Slack, or via third-party connectors like Zapier or IFTTT. To create an RSS in Trending, click the "RSS" button in the top right corner. To create an RSS in Monitoring, click the "Options" button in the top right corner and select "RSS." If you have ideas for other integrations that you'd like to see, please let us know.